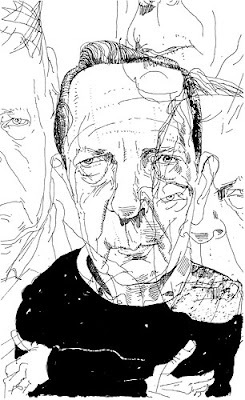 John Cheever. Ilustración: Joe Giardello/ NYT. I recount this now because, a month ago, dizzy from the international hype that Knopf’s weaving around his new collection, John phoned from Westchester to say he’d be in town on Tuesday and longed to see me: I was “the only homosexual” he knew in New York. Well, I was not to be here on Tuesday, couldn’t he call again? Call again he did, and on the 19th came to lunch. I specifically asked J.H., who has never met John, to be present, although J.H. … has problems too, and violent stomach cramps. John arrives early. No sooner in the door than he drops his pants, pleads, whispers how lonely he is; I’m already in a state about J.H.’s depression - J.H., who’s to arrive in five minutes - and about the quiche in the oven, and John like a bull in a china closet chases me about, like a Mack Sennett comedy, until I lock myself in the bathroom. “Please come out, I’ll be good.” So I come out, and we sit nervously on the sofa, John still with his trousers around his ankles, when J.H. comes in. Transformation. At the sight of J.H., John becomes calm, contrite, angelic, in love. We have lunch, discuss his emotional isolation. J.H. offers to take him to the baths; no, he just wants to sit on the sofa for a while with J.H.’s arms around him. I do the dishes. This entry was posted on 3.17.2009 at 2:57 p. m.. You can skip to the end and leave a response.